How Bored is Your Dog? Trying to determine if your dog is experiencing anger, love, or any other “human” identifiable emotion (including depression) is difficult. To date, no one has been able to provide convincing scientific evidence that we can distinguish one emotion from another by what our brains or hormones do. We obviously feel differently when we’re in a loving versus an angry mood; however, what our brain does to influence us to feel those very different emotions is less clear. Nonetheless, we believe that our pets ‘love us’, they appear to showcase emotions that we recognise in our own species, and they certainly look like they’re feeling guilty after doing something wrong. But do they know right from wrong, and when they do the wrong thing, do they really feel guilty or is this not just a trick of the human mind to make us see what we already know and understand, asks Ryan O'Meara. What most animal behaviour experts are happy to agree on is that dogs can and do suffer with anxiety in certain circumstances and anxiety can manifest in many ways and can affect dogs differently. Let's try something, shall we? Let's just substitute the word depression for boredom. Now we're getting somewhere. Boredom is a mood killer. For a dog to be bored they will often try to stimulate their mind in a way that can manifest in destructive or otherwise negative behaviour. So for many dogs, simply being separated from us can cause them to display signs of anxiety or depression (known as separation anxiety) or, let's substitute that word again, boredom. For dogs who suddenly show a change in mood, it’s always wise to have a vet perform tests. Dogs who very quickly change in their demeanor or temperament could have something physically wrong with them. Let's establish one key thing. Dogs, all dogs, require a degree of mental and physical stimulation. Each dog has their own needs in terms of the levels of stimulation they specifically require but all dogs need some. Some dogs can become so bored / anxious that they resort to harming themselves. This is usually manifested through chewing of feet or even gnawing on their own legs. It’s important to intervene if your dog is chewing their own feet as they can cause themselves significant physical damage, which can lead to infection, but more pertinently a dog chewing their own paws is demonstrating an undesirable behavioural pattern, the underlying cause of which we should be committed to solving. Canine compulsive disorder is extremely rare. It is thought that less than 3% of all dogs have it, but you should seek the advice of a suitably qualified professional to find out if there are underlying problems causing your dog to chew their own feet. By far the most common cause that leads to dogs chewing their fee is boredom. It is a serious problem and requires owners to work on daily plans to ensure the dog is properly stimulated, both mentally and physically. Stress is the body’s response to any physical or mental demand. The response prepares the body to either fight or flee. It increases blood pressure, heart rate, breathing and metabolism, and there is a marked increase in the blood supply to the arms and legs. It is a physiological, genetically predetermined reaction over which the individual, whether a dog or a person, has no control. When your dog is stressed, his body becomes chemically unbalanced. To deal with this imbalance, the body releases chemicals into the bloodstream in an attempt to rebalance itself. The reserve of these chemicals is limited. You can dip into it only so many times before it runs dry and the body loses its ability to rebalance. Prolonged periods of imbalance result in neurotic behaviour and the inability to function. Stress is characterised as “positive” (manifesting itself in increased activity) and “negative” (manifesting itself in decreased activity). Picture yourself returning home after a hard day at work. You are welcomed by a mess on your new, white rug. What is your response? Do you explode, scream at your dog, your children and then storm through the house slamming doors? Or, do you look at the mess in horror, shake your head in resignation, feel drained of energy, ignore the dog and the children and then go to your room? In the first example, your body was energized by the chemicals released into the bloodstream. In the second example, your body was debilitated. Dogs react in a similar manner, and stress triggers either the fight or flight response. Positive stress manifests itself in hyperactivity, such as running around, bouncing up and down or jumping on you, whining, barking, mouthing, getting in front of you or anticipating commands. You may think your dog is just being silly and tiresome, but for the dog, those are coping behaviours. Negative stress manifests itself by lethargy, such as freezing, slinking behind you, running away or responding slowly to a command. In new situations, he seems tired and wants to lie down, or sluggish and disinterested. These are not signs of relaxation, but are the coping behaviours for negative stress. Dog’s don’t ask a lot of us; all they really want is food, shelter and a bit of company. Their demands don’t stretch to “being understood” or “feeling valued” but they do have certain basic requirements that ensure their mental health is in tact and Lana Rose explores the reasons behind them. Trauma and mistreatment can really imbalance a dog’s capacity to function usefully and properly. Anxiety, edginess and general hyperactivity are strongly associated with dogs that have been mistreated. But thankfully this is relatively rare. 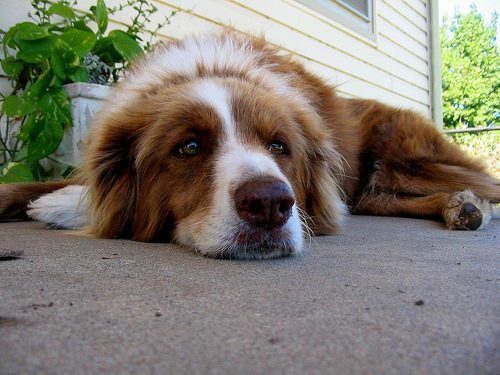 The most common blight on a dog’s mental health is boredom. Allowing your dog to practice their natural instinct to chew, whilst keeping them away from the shoes and furniture can be a challenge. The Busy Buddy® Jack™ is a treat-holding toy that houses treats in multiple places. Encouraging extended playtime for your four legged friend, you can adjust the positions of the treat rings allowing you to increase the challenge to find them depending on your dog’s level of play. Available in sizes small and medium. Dogs spend a considerable portion of there time inactive, however as an opportunist, the dog is adapted to seeking a wide variety of rewarding situations in unpredictable locations. The dog is therefore much more likely to be interested in novel items and circumstances. In contrast, a predictable and limiting environment may make these non-active periods boring and as such we see an overall decrease in interaction within the environment. The dog becomes socially and emotionally lethargic. The dog is famed as being a very adaptable animal and a healthy adult can cope with a range of conditions, particularly if it has access to areas with different environmental surroundings. Animals have emotionally complex lives and need appropriate environments and stimulation. Good housing, giving the dog ‘a place of their own in the home’, affords them the opportunity to exercise a degree of choice, to manipulate or chew safe objects, to interact with humans, to choose not to interact, to play, to rest, all of which satisfies their behavioural needs. Providing a positive, rewarding and stimulating environment based on trust and affection teaches our pets to stay enthusiastic and interested. The purpose of environmental enrichment is to increase the overall welfare of the dog by allowing them to burn off calories in a safe and natural way, which in turn allows them to behave more naturally in a restricted environment. The dog learns to cope with unexpected changes in the environment, and is less likely to be stressed by handling, restraint or changes in environment. A decrease in emotion based behaviour can lead to a decrease in physiological and psychological stress. Food, water, foraging, sniffing / scenting, attention, grooming, coolness (when body temperature is high), and warmth (when the body temperature is low). These are all known as primary reinforcers. As these examples suggest, primary reinforcers often relate to biological processes. Some primary reinforcers are not immediately obvious; for instance if you were a dog restrained in your home/kennel and cannot move about or get out, the chance of freedom can be very reinforcing and you would strive to achieve it more than a dog who had open access to fields for most of their day. Why Is It Important To Know What Your Dog Likes To Work For? Prevention is better than cure. Knowing what a dog likes and will work for is an important factor in having a stimulated dog; especially if the animal spends most of the time looking at four walls and food is provided independent of its behaviour. Valuable article for us humans who care about our canine family members. Thanks. Good article! “….the opportunity to exercise a degree of choice, to manipulate or chew safe objects” I never thought about it as exercising choice before. I only leave one toy out at a time so he doesn’t get tired of them – and because tough pitbull toys add up very quickly! (my other one doesn’t care about toys and my third only wants his special toy) but I guess more toys out means more fun picking which one he wants! Planning a Day Out with Your Dog? You Need to Read This!